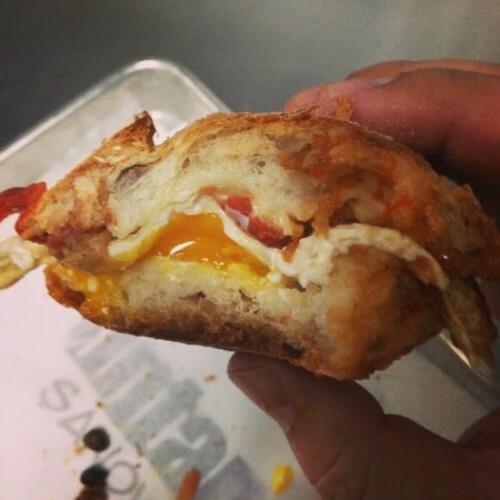 In an exciting runny-yolk related development, Untamed Sandwiches is now serving breakfast. And I think we can all agree that even though I am inherently biased, Untamed makes damn good sandwiches. Adding on to their lunch and dinner menu, Untamed’s breakfast will feature eggs, braised meats and seasonal vegetables, all served on those amazing crusty rolls from Grandaisy bakery. I am most excited to try the Ol’ Grumpy with soft scrambled eggs, grass-fed beef chili, pimento cheese, hot jam, and cilantro. If that doesn’t sell you on it, just look at the photo they sent out to their email list…Breakfast served from 8-10:30. Posted by Sarah Zilinski at 11:13 am, July 10th, 2014 under Breakfast, Untamed Sandwiches. Can you add the photo for those of us not on the list? I think that’s the photo above. (Was it just added?) And dare we ask the price for one of these? Because their cheapest lunch sandwich is $10 (for 1 of 2 veggie options. Not exactly ML stuff. And MB should be under $5, btw! !